This is especially apropos because the parable discusses the incarnation in detail, in symbols, such as “oil and wine” and the beast of the Samaritan. A lawyer was a Jewish teacher, a so-called expert in the Law of Moses. The lawyer was one of many who asked questions in order to trip up Jesus, in order to find some basis on which to judge him, and have Him done away with. The lawyer must have heard of Jesus teaching, and was repeating it. 3. Look carefully as Jesus’ answers to questions. The answer is always much greater than the question, and often does not directly answer it. Only those with ears to hear will understand the Lord’s multifaceted answers to questions. Like most parables, there is an external and internal meaning. 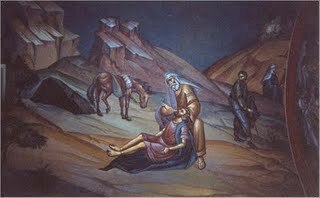 The external aspect of the parable of the Good Samaritan is a teaching concerning true charity, in answer to the question “who is my neighbor”. There are many internal meanings in the symbols of the parable, which is a wonderful description of the ministry of Jesus Christ, and the effects of the incarnation on the state of man. Some of the things taught in the parable are detailed information about the effects of the incarnation, the nature of man, the effects of sin and how it is healed, the ministry of the church and the second coming of Christ and the judgment. The "certain man" is Adam and all his descendants - all of mankind. This parable is describing man's condition and the means of his restoration. The word "Jerusalem" is interpreted "Vision of peace", and has always indicated the heavenly state. The man was headed to Jericho, which is in the valley away from Jerusalem, and indicates, as Blessed Theophylact teaches, that he was traveling to: "a place sunk down low and suffocating with heat, that is, to a life of passions". The tense of the verb is "going down", not "went" down". This trip, from Jerusalem to Jericho, then represents our fallen human nature, which is continuously going down towards a passionate life, if not for the mercy and help of God. The thieves represent the demons, and the stripping of the raimen t the loss of virtue which happens because of “wounds” of sin. The man was left “half dead” because the demons cannot kill us; they can only wound us. There are two interpretations to the actions of the priest and the Levite. One is immediately obvious, and is unfortunately the only meaning many people assimilate. The other meaning is much more profound. Of course, the lack of charity of the two men is apparent. They passed by because if the man died when they were touching him, they would have been ritually unclean, and would have had to go to an extensive ritual of washings and purifications according to the law. The priest represents the law, the Levite, the prophets. The law and prophets can teach and guide, but they cannot save; only God can save. That is the reason why these two “passed by on the other side” – none of their ministrations would be able to save human nature wounded by sin. Also note that they came to the man “by chance”. The Samaritan is Jesus Christ. He did not come to the man by chance, but journeyed and came to where he was. This describes the purpose of the incarnation – to come to the nature of mean, in its diseased state, in order to heal it. So much of the profound meaning of the parable is present here in one short sentence! “Binding up His wounds” symbolizes the self control that helps us to stop the hemorrhaging of sin. Christ helps us, not binding us against our will, but He helps us with self control. Whatever sin you have -- you cannot name a sin that God will not help you to conquer. You cannot name one. The oil and wine refers to the dual natures of Christ. It also refers to the two ways in which Christ acts, and indeed, how all of the teachings and actions of the church, His body are. Some teachings are merciful and are gentle. They are promises, and things that give us hope and comfort us. Some teachings are harder. They tell us when we are foolish, or doing things that are evil, or dangerous. The beast signifies the incarnation. He took a sick and a dying man, and he raised him up, and he gave him the ability to live. He took on flesh, and made this flesh able to comprehend and apprehend God. Beforehand, it wasn’t possible, because we were laying by the road, all bruised and bleeding, but he put us on His beast – he became incarnate for our sake. He is our strength when we are weak. He carries us at all times, at every moment, because of His love for us. 10. “And on the morrow when he departed, he took out two pence, and gave them to the host, and said unto him, Take care of him; and whatsoever thou spendest more, when I come again, I will repay thee.”. “On the morrow when he departed” represents the Ascension of Jesus Christ. The “host” (or innkeeper) represents the pastors and teachers of the church, preeminently the bishops, priests and monastics, who are entrusted with the care of the flock. The “two pence” represent the reward we will receive for fulfilling God’s commands. “When I come again” references the Second coming, and the Final Judgment. This document is a list of ten (more or less) things about a particular topic. More “Ten Things” topics may be found at http://www.orthodox.net/10things. They are also posted to the blog of St Nicholas Orthodox Church, McKinney Texas, called “Redeeming the Time” – http://www.orthodox.net/redeemingthetime. Look under the category “10things”. Use anything you wish, but please indicate authorship, with the URL.